The Open Air School was privileged to be one of the seven schools invited to participate in this project. The challenge was to design and create a miniature F1 car of the future. It must be made of balsa wood and must run on a 20 metre track. Their designs, business plans and marketing campaign were displayed together with their track and cars. 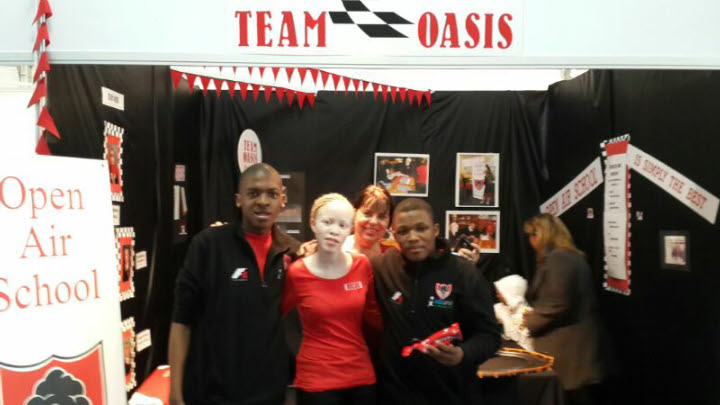 Aaminah Pharos, Bongiwe Dubuzana, Phumlani Bhengu, Smiso Mtangwa and Minenhle Zulu form part of TEAM OASIS who represented Open Air School at the Festival. Many thanks go out to Ms N Van Wyk, and Mrs B Naidoo, for all their hard work and for going above and beyond the call of duty. Copyright 2015 of Open Air School, KwaZulu Natal, South Africa. All rights reserved.